Okay, if you noticed I have a new shortcut links on the right sidebar of this blog, and one of the shortcut is linked to my favorite Fragrance section. As you might probably know by now, I love fragrance or basically anything scented. So that's why I have quite a lot of body mists, body lotions, shower gels and soaps, perfumes, scented candles, etc.. Basically I collect anything with a scent. So that's why I decided to add a new "label/tag" to this blog which is "Fragrance" - in which I posted about scented products. It could be shower gels, soaps, lotions, candles, perfumes, etc. I have reviewed some of these type of products before, so please feel free to browse around by clicking the tag or the shortcut link on the right sidebar. Meanwhile, here is one review of those scented products which is: my current favorite body cleanser. Etude House is a very popular Korean brand which always comes out with good products and cute packaging. This body wash is simply one of them. 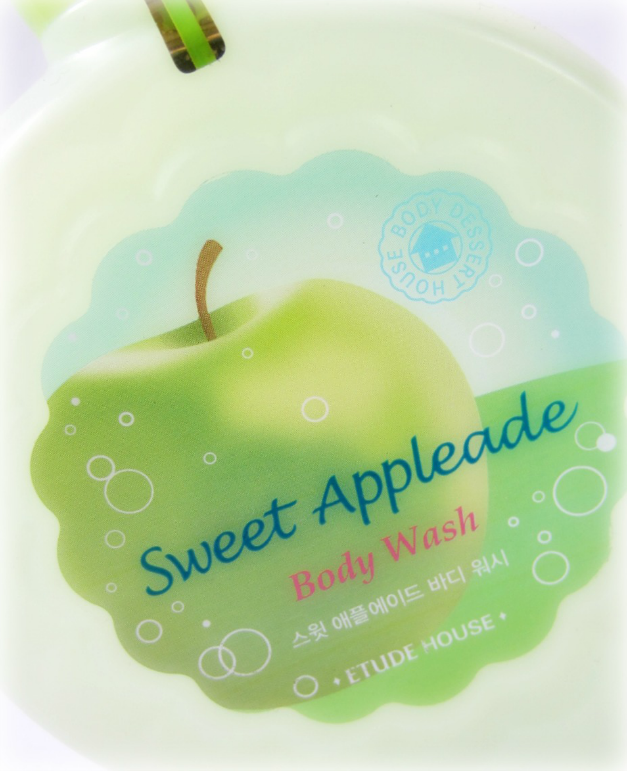 I got this Etude House Sweet Appleade Body Wash as a gift and been saving it in my stash. I just recently use this body wash when I ran out of my previous shower gel. The body wash comes in a rather unique bottle shape. 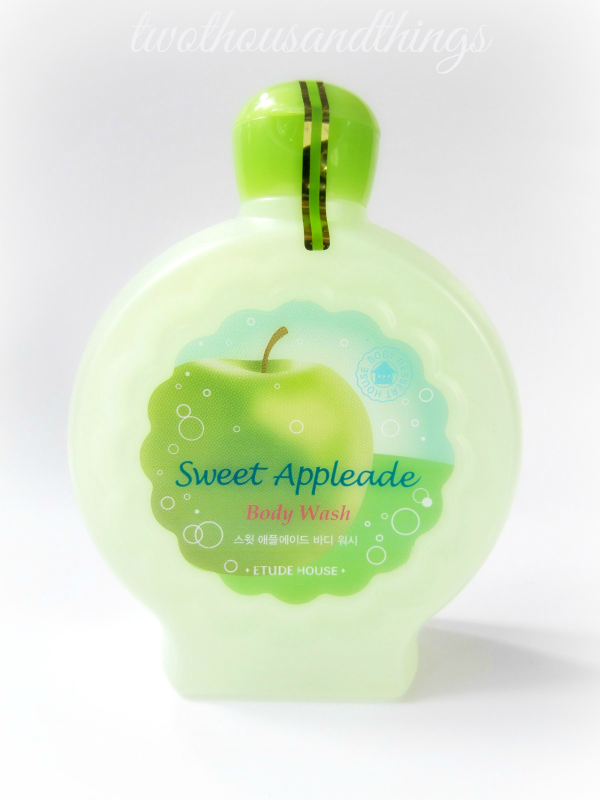 The green color of the bottle and the apple picture at the front makes it really clear that this body wash has green apples scent. On the bottle it says that it is a "cool and delicious" body wash. The active ingredients are orange, lemon, bilberry, sugar cane, and sugar maple extracts, and (according to the bottle) those various fruit extracts are supposed to supply elasticity to the skin. I believe this is actually from an old collection of Etude House called the "Sweet Appleade" collection. Etude House always release new collections every year, sometimes they even release 2 to 3 new collections in a year (if I'm not mistaken). Each of the collection always have unique theme such as this Sweet Appleade ones. The scent is very refreshing and it does smells like sweet green apples, somehow it kinda reminds me of "summer and pools". The texture of this body wash is a bit different than regular body wash because this one has a colorless hard-gel texture that you have to squeeze out of the bottle. So it's not runny at all, more like a hair-gel type. But once in contact with water, the clear gel becomes sudsy and foamy just like regular body wash.
As I told you above, I like using it in the morning or whenever I need a pick-me-up because the combination of the fresh apple scent and the cool gel texture of this body wash is a great boost to start the day or to lift up a somber mood.